The Crosslane coupe sets the styling trends for the next generation of Audi's Q-badged crossovers. Audi previewed plans for a future crossover smaller than the Q3 with the Crosslane coupe concept unveiled Thursday at the Paris auto show. 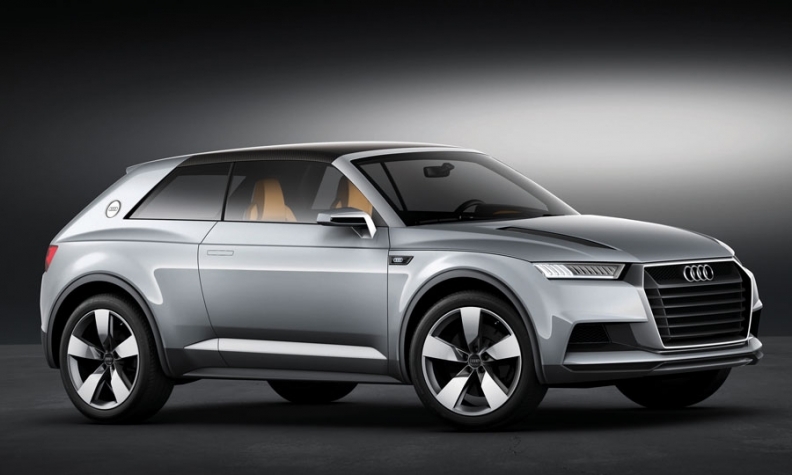 Likely coming to market in 2015 with the Q2 nameplate, the new vehicle uses the Volkswagen Group's new MQB modular platform. The Q2 would compete against vehicles such as the Mini Countryman. The Crosslane coupe also sets the styling trends for the next generation of Audi's Q-badged crossovers, previewing a new construction philosophy the blends carbon fiber and fiberglass components into the aluminum space frame. Under the hood of the concept is a plug-in hybrid powertrain that combines a turbocharged, three-cylinder 1.5-liter engine with a generator and an electric motor. Audi says the powertrain delivers fuel consumption equivalent to 1.1 liters/100km (214 mpg U.S./257 mpg UK) in the concept, which weighs 1392 kilograms (3,064 pounds) and claims a top speed of 189 km/h (113 mph). Audi says the concept's 17.4 kilowatt-hour lithium-ion battery pack could power the car for up to 85 kilometers (53 miles). The powertrain uses the electric motor only at speeds up to 54 km/h (34 mph) -- then the three-cylinder engine kicks in to join with the electric motor. When speed passes 130 km/h (81 mph), the engine, rated at 130 hp, is the sole power source. The Crosslane coupe concept is shorter, wider and has a lower ride height than the Audi Q3. It has a 2+2 seating arrangement, with an electric-powered cargo floor that moves forward over the rear seat bottom cushions to expand cargo room. The roof panels over the front seats, made from carbon fiber, can be removed. The spaceframe for the Crosslane coupe is made primarily from aluminum, including the passenger cell. The front- and rear-crash structures are made from carbon fiber, as are the center tunnel, the firewall and crossmembers. The body panels are made from fiberglass. Audi says the concept will run from 0 to 100 km/h (62 mph) in 8.6 seconds in hybrid mode and 9.8 seconds on electric power only.